Adds autoplaylists (iTunes "smart playlists") to Google Music. 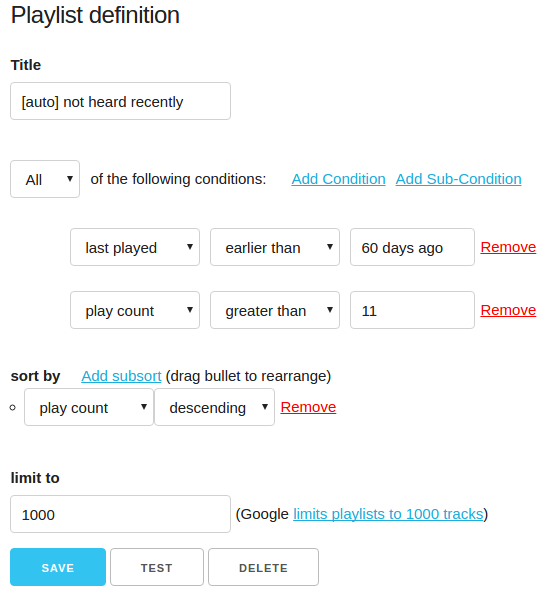 This Chrome extension adds customizable rule-based autoplaylists to Google Music. They work just like iTunes "smart playlists". This extension is not supported nor endorsed by Google. You can install from the Chrome Web Store: Autoplaylists for Google Music™. It's available in a free version (limited to a single autoplaylist) and full version. All users get one week of the full version for free as a trial. See the the versions and upgrading section of the FAQ for all the details. open a tab to https://play.google.com/music/listen. click the extension's "page action": the small icon to the right of the url. your autoplaylists will be updated automatically in real time. See the FAQ for more details. Newer versions of Chrome put the icon to the right of the star. Visit the wiki for support and more details on how the extension works. The code powering the extension is open source, and contributors get free lifetime access to the full version (at my discretion). For more details, see the GitHub project page. To receive announcements about new features or improvements, join the announcement mailing list. The changelog on GitHub also has detailed descriptions of what's new in each release: CHANGELOG.md. Google Music is a trademark of Google Inc. Use of this trademark is subject to Google Permissions.